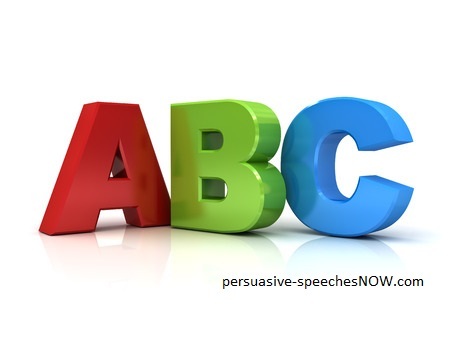 A persuasive speech SAMPLE to help you with THAT speech. Free for your use. Why struggle guessing, when this persuasive speech sample will outline and demonstrate exactly what is needed in a persuasive speech. This is how to write the speech that persuades. This persuasive speech sample demonstrates how the persuasive speech Outline is actually used to create a compelling, persuasive speech. Attention or Introduction, then comes the main Body of the speech, and ends in the Conclusion. Attention of the audience is gained, how the speaker Bonds and links to each audience member by creating "hooks" into their everyday experience. The exact hooks will depend on your audience research. There is the establishment of the Speaker's Credentials, identification of the speech's Destination or outcome, and then an Explanation of the Map to get to the destination. Then finally a Flow statement to transition or link into the Body of your speech. It's as simple as A B C D E F ! how it finally challenges the audience. A sample will make this more clear. Note that the persuasive speech sample used was a real speech and about a technology which was not as pervasive as now. Use it as an example of how ABC and abcdef works to structure a speech. "Tells your audience what you are going to tell them"
and establishes the foundation for your speech. A good Introduction 'draws the map' for the journey. Who here communicates with others? Today, I want to describe to you what I call the 8th Wonder of the World. This wonder is right up there with the Pyramids, with the Hanging Gardens of Babylon, with the Collossus of Rhodes. It is not though of the ancient world. It is though a marvel of engineering and cooperation amongst the nations of the world. Today as well as the telephone, I use the Internet, I use eMail. Putting these together, I can communicate anywhere anytime. Did you know, that "the number of emails sent on an average day triples every few years". Do you know that they are all asleep in Australia? Last year I rang to ask a business question to only get the night security guard. It was good of him to take my call. Now I email at any time and receive the needed information back as soon as the other office is open. emotional experience (grief and sorrow, happiness). To speak with another: devices like the telephone, mobile telephone or cell phone. To access information: television, cable TV, satellites, Google and even Netflix. To bank: we use ATMs To travel: vehicles, planes and trains To get to a destination: Global positioning systems (GPS) guide airplanes. Think of your kitchen, car, office, cinema, your local shopping centre. Think of the technology you use, you rely on. your own use, experience or study. I use eMail every day in my work, my business and for personal communications. I discovered eMail when I was studying many years ago. It was used as THE communication medium between the lecturers and between colleagues in my study team. We relied on eMail. why you are speaking at this moment. you expect as an Outcome. is the most effective way to do business today"
Today, I want to share my insights into this amazing communication method, and convince you of its hidden potential, in YOUR life today. "Tell what you are going to tell them"
What will we look at in the next few minutes? Firstly, a quick look at how the Internet and eMail has shrunk the world. Secondly, how business has been revolutionised, and Thirdly, how personal relations are enhanced by these new technologies, that's right, personal relations! Who ever thought a computer would help relationships. from one section or point to the next. "Let's begin by ...", "Let's start with ..."
or I prefer "Let's consider ..."
Attention, Bonding with everyday "hooks", your Credentials, Destination map, Explanation of the map and Flow or transition to the Body of your speech. (you can have more, but don't confuse your audience). Why is this occurring? Because, eMail is easy to use. eMail is very fast to both send and to receive. Recently when planning a holiday in England, the Internet and eMail were used to book hotels and hire cars organised across multiple time zones. No more ringing and trying to get people who are in bed other than at a sales desk. How often have you thought "don't they ever wake up over there?" I did. Transition: Create a linking statement to Point 2.
it must be easier to do business. Business can now literally operate at the speed of light. eMail is simple easy to use and fast. eMail reduces the formalities of paper-based title pages and wording in say a Sales quote eMail makes retrieving an old eMail easy when comparing negotiations. The Internet gives "instant" access to information from anywhere in the world. From my desktop I can negotiate the best price for a transaction regardless where the shop is in the world. In fact I have more suppliers to choose from. Telephone tag (when you ring and they are out) is eliminated. Publishing words or pictures is simple. Anyone can publish on the Internet. I can stay in touch with the office anytime when I am out of the office, using the Internet and eMail. The Internet and eMail has revolutionised business and enables business to be forever open conducting business 24 x 7 (24 hours by 7 days). The Internet and eMail enhances personal relations eMail can even explode personal relationships in a new dimension. Your message can be short, succinct and to the point. Stay in touch when do not wish to speak. I eMail to a busy sister in another State - because she is rarely home, using eMail means the call is not missed if I was to telephone. When it comes personal relations, eMail enables cheap effective communications which are never missed, unlike the telephone. They are there when you connect to the Internet. "Can we consider these main points ..."
Today we have explored a powerful vehicle called the Internet, and an effective tool for communication called eMail. eMail can explode personal relationships in a new dimension. "make a decision now to be involved ..."
"Coming around is the petition ..."
your contribution to this noble cause, dig deep ..."
I am so excited by this technology, that today I have a FREE Internet Starter Kit available for you. It is being handed out now. Take this free sample, there are no strings and no obligations. Read over the attached sheet accompanying the CD. My number is there, give me a call if you get stuck or have a question. There is no charge, as I simply know you can use this 8th Wonder of the World. The best way to find out if eMail is of any value to you, is to give it a go. It's time to get with the action. Get into eMail. Explore this modern 8th Wonder. Send an eMail message to a friend, a son or daughter, to a grand-child. Surprise them. 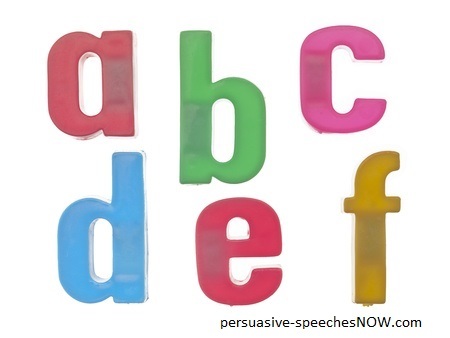 The above persuasive speech Sample uses an Outline that is tried and tested and used by me personally. It is guaranteed to work especially if accompanied by the other resources from this Website. This persuasive speech Sample will help you to see how the Outline is used. Be patient, it takes time to write a good speech and YOU can do this, as all the tools you need are here on this Website, and growing every day. Start with this persuasive speech Sample, then have another look at the persuasive speech Outline in summary form. YOU can do this, after all YOU are here undertaking this research right now into a persuasive speech sample. Have your speech written for you? Right, I have my persuasive speech Sample, so what do I do now? This Sample and YOUR speech are composed of mere words. Words alone do not make a speech. The DELIVERY of these words will pack your speech with POWER, and PERSUASION. Check out the DELIVERY of YOUR Speech. This is where the structure and words are given steroids as YOUR DELIVERY empowers your words, empowers the structure, and YOU PERSUADE your audience. Do you need humor for YOUR speech? The best most original, guaranteed to cause smiles to raucous laughter comes to you from How To Be Funny. - it will put a smile on your face :) Guaranteed ! If you are in a hurry, subscribe to the Newsletter NOW, for tips sent to you regularly ... Powerful Speeches Newsletter. ** This is an ACTIVE and growing site, almost right before your eyes. Have a look at the persuasive speech power DELIVERY techniques, tips, PLUS an amazing secret that will 'capture' your audience - guaranteed. Your FEEDBACK is valued ... has this page been helpful? Have you noticed that everything here is FREE !. Find out how we try and keep this Free Speeches information OASIS FREELY available for you. This persuasive speech sample shows how the persuasive speech Outline is used.